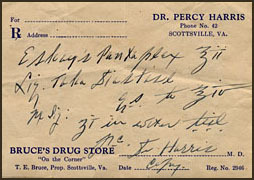 Name: Dr. Percy Harris, Sr. Comments: Shown in this 1915 photo, Dr. Percy Harris, Sr. stands beside his Maxwell car on West Main Street with Valley Street behind him. The building just behind his right elbow is W.F. Paulett Lumber and at the photo's left is a three-storied, white building called the Travelers' Rest Hotel. 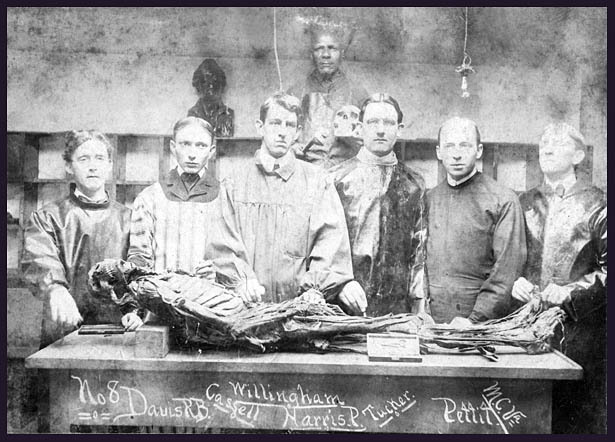 1901 MCV Anatomy Students (l to r): R. B. Davis, Cassell, Willingham, P. Harris, Tucker, & Pettit. At the start of the twentieth century, many people still died from infectious diseases; consequently, in 1900, the average life-span of a white male in the United States was only 47 years. Medical scientists looked for ways to kill bacteria that caused incisions and wounds to become infected. If the wounds turned septic, a life-threatening condition could develop if the infection spread to the patient's blood. Leading medical figures of the day debated whether surgery should be accomplished with gloves to lower the risk of increased infection for their patients. Some doctors felt wearing gloves involved a loss of delicate sense of touch and of skill in fine surgical manipulations. Instead, they sanitized their hands via complex rituals of scrubbing hands with soap and water, followed by soaking them in sterilized water or saline and drying with sterile towels. Some doctors even believed that dissection and subsequent surgery with bare hands were completely safe, provided the cadavers had been properly injected with disinfectant solutions. Although it's not known if the cadaver above in the 1901 anatomy class included disinfectant solution, all of the students are shown dissecting with their bare hands and without gloves. When Percy graduated from MCV in 1905, he practiced initially in Grafton, Virginia, but moved his practice and family to Norwood, Virginia, in 1906. There he supplemented his income by serving as a doctor for the Piedmont Quarry and for the Chesapeake and Ohio Railroad. 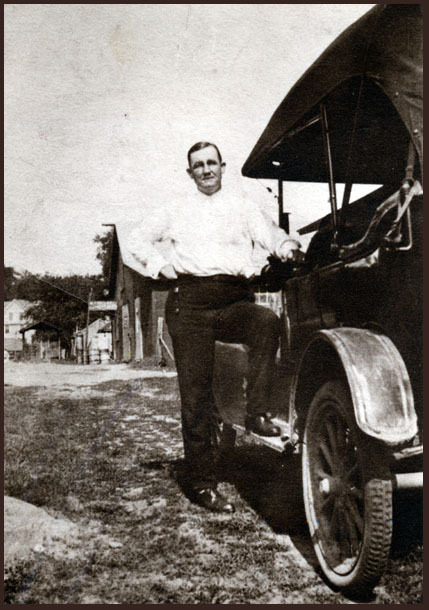 As a railroad doctor, Percy treated sick and injured employees and, on more than one occasion, traveled to the injury site via railroad handcar. He once told about setting a man's leg at the scene of an accident with a board off a nearby fence. Dr. Harris came to Scottsville in 1912 and served for nearly fifty years as a general practitioner for the town and for the Chesapeake and Ohio Railroad. 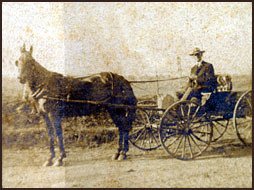 Before obtaining a Maxwell automobile in 1915, this horse and buggy were his primary means for making house calls. He once traded a mail carrier for a horse and learned to adapt to this horse that stopped at every mailbox. Dr. Harris made housecalls to treat patients in Albemarle, Fluvanna, and Buckingham Co., Virginia throughout his practice in Scottsville. His grandson, Ranny Moulton, says he learned to drive while accompanying his grandfather on house calls as Dr. Harris let him drive the car in the countryside. When Dr. Harris arrived in Scottsville, his first office was over the Fidelity Bank on the east side of Valley Street. In 1915, Dr. Harris moved his office into his home at the converted Creamery on West Main Street and then to his new brick home, now called the Harris House, across the street in 1934. Ranny Moulton recalls fondly the times that his grandfather invited him to sit in on an office visit with an agreeable patient: "I remember the visits of John Henry Phillips in particular -- he was the mail carrier, and it seemed like he had to get a shot each week. So I went to Pa's office to watch John Henry get his shot and in the process became interested in medicine. At one time I had an idea about becoming a doctor, although that dream faded away after my first year at the University!" John Randolph Phillips: "Dr. Percy Harris was a happy giant, who also served as Mayor of Scottsville and whose very presence in a sick room started the ball of recovery to rolling." Margaret Bradley Forsyth: "Dr. Harris was a great big man and just the sweetest thing. When my daughter was a baby, she had a terrible colic. And I remember he came out to our house, and I have a vivid memory of him picking up my baby, putting her on his shoulder, and patting her gently on the back. He was calming her down and calming me down, too!" Richard Ludlum Nicholas: "Dr. Percy Harris was a wonderful fellow. He looked like a doctor and acted like a doctor. He was a perfect role model for us all. You would go into his office and feel like you were going to die in the next minute. Dr. Harris made house calls and would come out into the country to see you if you were sick. And he brought me into the world -- he was my doctor!" Haden Anderson: "Dr. Harris was a person, who made a contribution to the town. He made house calls and was good at his work. He was very likable and well-respected in the community -- he was my doctor." Dr. Harris also served as Mayor of Scottsville from 1943-1953 and was a charter member of the Scottsville Lions Club and a member of Masonic Lodge 45. He was married to Innes (Randolph) Harris and the father of four children: Innes Roberta; Mary Peyton; Percy, Jr.; and Susan Randolph Harris. 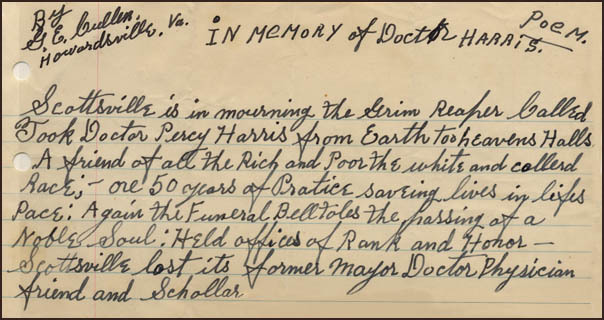 Dr. Percy Harris, 73, of Scottsville, for fifty years a practicing physician in Virginia and for the entire time a member of the Medical Society of Virginia, died unexpectedly Friday, 4 February 1955, about 7 o'clock pm at his home. One of the leaders in policymaking and in the extension of the Virginia Society, Dr. Harris recently received a commendatory award recognizing his half-century of service in his . He had not been well for several years, but was not confined to his bed and his condition was not considered critical. His wife, the former Miss Innes Randolph, daughter of the late Mr. and Mrs. Peyton Randolph of Amherst, to whom he was married in September 1904, survives him together with three daughters, Mrs. John Moulton of Scottsville, Mrs. Harris Haynes and Mrs. Mary Peyton Harris Boan, both of Richmond, and one son, Percy Harris, Jr., of Camden, S.C. Surviving also are two grandsons, Randolph Moulton of Scottsville and Percy Harris II of Camden and one granddaughter, Peyton Harris of Scottsville. Dr. Harris was the son of Frederick Joseph and Roberta Drummond Harris, and was born March 18, 1880, in Nelson County, at their home in the upper James River section. Three sisters, Mrs. A. A. Miller, Mrs. William Ingles, and Mrs. Bradley Bynum, all of Radford, survive. Dr. Harris was educated at Brown School in Nelson County and at Kenmore School at Amherst. He received his medical degree from the Medical College of Virginia in 1905. He was widely related in Albemarle, Nelson, and Amherst counties. In Scottsville, he had been identified with county affairs and was also owner of several large farms. He was a member of the Presbyterian Church. He served several terms as mayor of Scottsville, was a charter member of the Scottsville Lions Club, and a member of Masonic Lodge 45, AF & M. He was a member of Phi Chi medical fraternity. Graveside services were held Sunday (6 February 1955) at 2 pm at Scottsville Presbyterian Church. The photo of the 1901 MCV Anatomy class is part of the Percy Harris, III, collection. Percy resides in Aurora, CO, and is the grandson of Percy and Innes (Randolph) Harris, Sr. The remaining photos are part of the Randolph Moulton collection. Randolph resides in Macon, Georgia, and is the son of John Adkins Moulton and Innes Roberta (Harris) Moulton. He is the grandson of Dr. Percy Harris, Sr.